Floats Assemble in Dudley Road, Pedestrians in Sacred Heart School (Old London Road). The Carnival starts at the top of The Bourne "Old Market Cross". Route is down All Saints Street, right onto the seafront (seaward side) round the fountain and return along the seafront (landward side) left into High Street, up High Street, and break up in The Bourne. 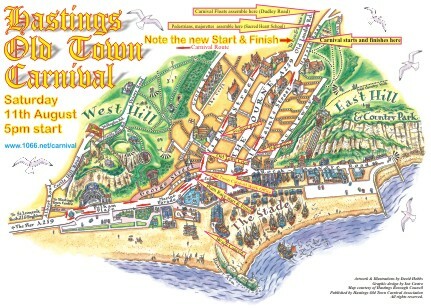 From June 2007 you will be able to Click here for 2007 entry form in pdf format (half a meg download) OR collect (from June 2007) from the Hastings Information Centre (Town Hall or Stade) or Butler's Emporium in George Street.